A Breath of Eyre Giveaway WINNER! Please email me at JoanneRFritzATgmail.com with your mailing address so I can get this out to you! And thanks to everyone who entered. If you didn't win, I hope you'll still buy the book. It's on sale now! This April 15th marks the 100th anniversary of the sinking of the Titanic, so there are a lot of new books (and old ones!) on display at the bookstore right now. Synopsis (from the publisher): When Kaspar the cat first arrived at London’s Savoy Hotel, it was Johnny Trott who carried him in. After all, Johnny was a bellboy and was responsible for all of Countess Kandinsky’s things— including Kaspar. But when tragedy befalls the Countess during her stay, Kaspar becomes more than Johnny’s responsibility: Kaspar is Johnny’s new cat, and his new best friend. And when Kaspar and Johnny meet Lizziebeth, a spirited young heiress, they find themselves journeying across the Atlantic with Lizziebeth’s family on England’s newest and most magnificent ship, the Titanic. Because there is always adventure in the air with a cat like Kaspar around. 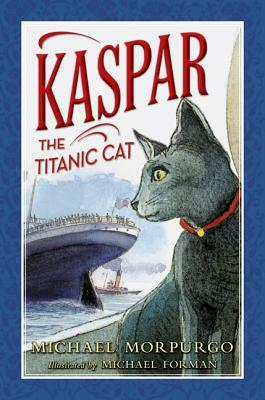 After all, he’s Kaspar Kandinsky, Prince of Cats, a Londoner and a New Yorker and, as far as anyone knows, the only cat to survive the sinking of the Titanic. . . .
Why I liked it: This is a sweet story and easy to read. The author was the writer-in-residence at the Savoy Hotel in London for three months in 2007 (do American hotels do this?) and was inspired to write this story by the black statue of a cat which the hotel uses as a fourteenth "guest" whenever an "unlucky" group of thirteen sits down to dine. Michael Morpurgo has written more than 100 books, and you may recognize him as the author of War Horse. He's great at making animals sympathetic characters. But unlike last week's MMGM post, this is no talking animal story. Johnny, the 14-year-old bellboy, tells the story. Kaspar remains a somewhat mysterious figure, being a cat. He'll still tug at your heart, especially when the nasty head housekeeper at the Savoy suspects Johnny is breaking the rules and keeping a cat in his room. And you'll laugh when Lizziebeth, who is about eight years old, saves the day by meowing. The title of the book is somewhat misleading, because the voyage on the Titanic only takes up a portion of the book (it's a few chapters and the disaster at sea is clearly described in a straightforward manner that shouldn't be too scary for younger readers -- after all, they've probably read the Magic Tree House version!). In fact, after doing a little research, I discovered that this book is actually a new edition of an earlier publication, Kaspar, Prince of Cats, a "picture story book" published by Harpercollins in 2008, with full color paintings by Michael Foreman. Too bad we only get black and white drawings in the new edition, although anything by Michael Foreman is lovely. Have you read any memorable Titanic books? I'm giving away an ARC of A BREATH OF EYRE by Eve Marie Mont, over at THIS POST. Hop on over there to enter. You have until 11:59 pm EDT on Wed March 28. Synopsis (from Indiebound): Ever since her police officer father was killed a few months ago, Grace Abernathy hasn't wanted to do much of anything. She's pulled away from her friends, her grades are plummeting . . . it's a problem. The last thing Grace wants is to be dragged into her older sister Regan's plan to train a shelter dog as a service dog. But Grace has no idea how involved she'll get - especially when a mangy mutt named Rex starts talking to her. Has Grace gone off the deep end? Or might this dog be something really special - an angel? A spirit? Either way, he is exactly the therapy that Grace needs. But this book is smartly updated with the current trend of rescuing dogs. The service dog training scenes are believable. Grace's grief for her dad is realistic. 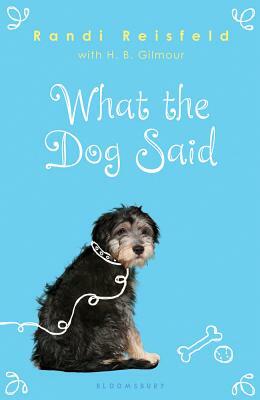 I actually expected this book to be kind of silly, considering the talking dog, but in the end I found it sweet and touching. Sadly, H.B. Gilmour, Randi Reisfield's co-author on the T*Witches and Clueless books, passed away from lung cancer before this book could be completed. Together, they had come up with an idea for a dog detective who speaks. After H.B. 's death, Randi shelved the book for a while until she had a brainstorm: to rewrite it as a tribute to H.B, ditch the doggie detective idea and give Rex a higher purpose. What do you think, readers? Can a dog be an angel? Or a spirit to help people who are grieving? Class of 2K12 Guest Blogger Eve Marie Mont, author of A Breath Of Eyre -- And a GIVEAWAY! 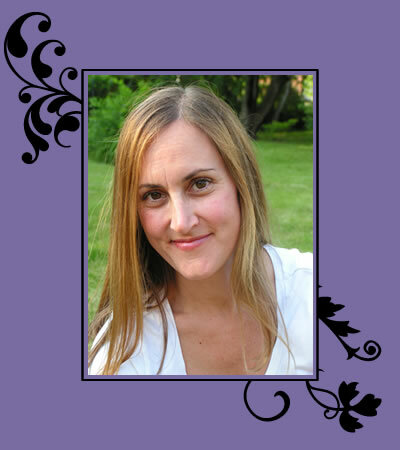 Today, I have the pleasure of introducing my first guest blogger, Eve Marie Mont, author of A Breath of Eyre, coming March 27, 2012 from Kensington Books (9780758269485), for ages 13 and up. I had the pleasure of meeting Eve at the bookstore back in January (for K.M. Walton's book launch party!). Why I liked it: It tingles with romance, intrigue, and humor, as well as some serious issues (death of a parent, standing up for what's right). Emma is a fully-developed character, with flaws and insecurities. I love time travel, and this book has a clever twist on time travel: instead of merely going back into the past, Emma actually enters the world of a book and becomes the character. How cool is that? I was delighted that Eve agreed to write a guest post for my blog. She talks about her favorite book from childhood, which is also one of mine! Take it away, Eve. The first time I experienced the magic that is The Secret Garden, I was sitting on the floor of my second grade classroom waiting for my favorite part of the week when our teacher, Mrs. Folk, would read books aloud to us. Mrs. Folk was a comforting presence with a short pouf of graying hair and eyeglasses that made her look like an owl. She sang and played piano and did all the voices in the books we read. I can’t imagine a person better suited to teaching kids whose brains were thirsting for good reading material to spark their imaginations. When Mrs. 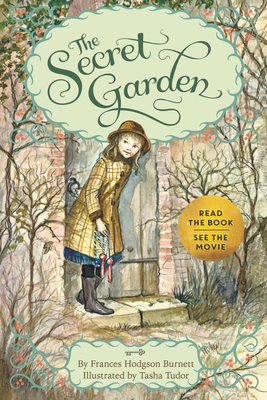 Folk began to read the first chapter of The Secret Garden telling us about an unpleasant little girl named Mary whose parents had been killed in a cholera epidemic, my first reaction was one of shock and surprise. Of all of the books I’d read up until that point in my life, none had ever killed off the parents in the first chapter! What kind of book was this anyway? But the story quickly transitioned into Mary’s journey from India to England to live with her Uncle, Archibald Craven, whose very name conjured up images of a sinister, hunchbacked ghoul. Mary’s ride across the moors in the slanting rain is a brilliant feat of descriptive writing that stuck with me over the years, making me reflect on how terrifying it would have been to have gotten plucked up from everything I knew and transplanted into a completely foreign place. But the most wonderful part of the story begins after Mary arrives at Misselthwaite Manor. Because it is here in this new land that a spoiled, unlikeable brat is transformed into a strong, compassionate girl by the beauty of the people and the landscape around her. I have always been a huge fan of using setting as character, and everything about Misselthwaite—from the cavernous mansion which traps the damaged uncle and the surly Colin, to the wutherin’ moors which sound like the sea, to, of course, the overgrown garden which comes back to life—are all so rich in atmosphere and magic that you can’t help but be transformed right along with Mary. The characters are equally charming. Dickon, with his simple Yorkshire philosophy and love of nature, is the perfect foil for Mary. And even sweet Martha and kind-hearted Ben Weatherstaff are fully rounded characters whom I wanted to know personally. But the most impressive aspect of the book for me is the character development of Mary as she grows stronger physically and mentally. No longer passive and sniveling, Mary learns to tend the garden and nurture animals, and in doing so, learns to tend to people and nurture friendships as well. Thus, Mary becomes the agent not only for her own growth but also for Colin’s, setting the stage for one of the most touching redemption scenes in literature. Some might say the ending is a bit mawkish, a little too neatly resolved, but remember, this is the same children’s story that began with the parents dying! Which childhood book first awakened your love of beautiful storytelling? Thanks for the guest post, Eve! I re-read The Secret Garden every few years because I love it so much! Readers, look for A Breath of Eyre at your local bookstore. Or you can order it from Indiebound! And watch a beautiful book trailer for A Breath of Eyre made by Eve herself! And now I have a giveaway to announce! 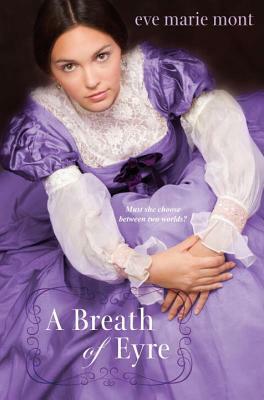 I was lucky enough to score one ARC of A Breath of Eyre, and I'm giving it away to one lucky winner. To enter, all you have to do is be a follower and leave a comment on this post. This giveaway will end at 11:59 pm EDT on Wednesday, March 28, 2012. You must be at least 13 years old to enter. International entries welcome. Good luck! Yes, I'm back from Revision Beach! I really missed reading all your blogs and participating in the MG love. Revisions are going well, but not as well as I'd hoped (so I may take some more time off soon). I've just about finished Draft 3 of my own MG novel. After another six or ten revisions, I may even be ready to start querying! :) I started a query letter, so that's progress. And I'm working my way through the agent interviews over at Literary Rambles. But enough about me. Let's talk about a Middle Grade novel I'm swooning over. Synopsis (from Indiebound): I won't describe what I look like. Whatever you're thinking, it's probably worse. Why I liked it: Astonishingly realistic characters populate an inspiring story with short chapters. That format and the clear, straightforward writing help to make a difficult subject easy to handle. Auggie doesn't really have special needs. He's just "different." You never know that much about his face, other than that his eyes are too far down and he doesn't exactly have ears. People are shocked when they first see him. The mean kids compare him to Gollum or ET or an orc. But Auggie's used to it. Be prepared to feel emotionally invested in this story of a boy coping with an unusual challenge. The first part is narrated by Auggie, but then the middle of the book is narrated by others, including his older sister, his best friend, and others involved in his life. I love how all these different voices combine to tell Auggie's story from different viewpoints. It really helps you get to know him better and understand what it must have been like for him to have this face. Long before I reached the end, I felt Auggie had become a real person. This book is going to win multiple awards. And they'll be well deserved. I'll go on record right now as predicting this will definitely win the Schneider Family Award. But I hope it also garners at least a Newbery honor next January. Read a marvelous interview with the author from The Observer that explains the origin of the book. And visit the author at her website. What books about kids who are "different" have you read and loved?